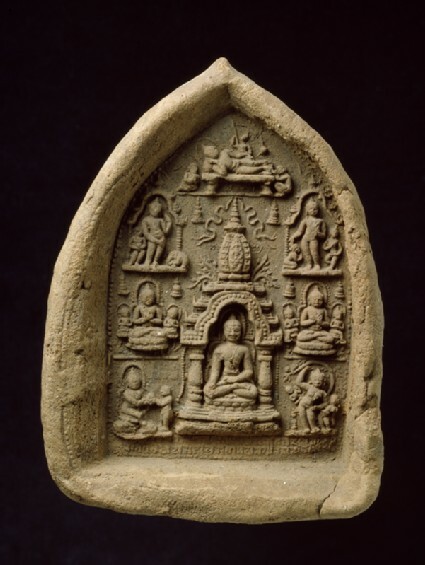 Buddhist terracotta votive plaques or tablets have been found in their thousands from Bodhgaya in Bihar to Pagan and other sites in Burma, as well as in Thailand and elsewhere. 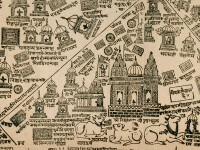 The practice of stamping out these depictions of the Buddha or scenes from the Buddha’s life as a devotional practice, often so deep in the matrix as to form almost a miniature shrine, appears to have originated in Bodhgaya. Their iconography is dominated by the great Illumination and the style is that of Pāla Bihar and Bengal, so much so that it is often not possible to establish where a plaque, or rather the mould from which it was stamped, was actually made, particularly as the ubiquitous Buddhist creed, when stamped below the image, is written in the commonest classical Indian script, Devanānagarī. There is no question, moreover, that the seals travelled widely. Like votive stūpas [EAOS.59], but portable, they could be used as a pious offering to a temple or carried home to a private shrine, a house or a monk’s cell. 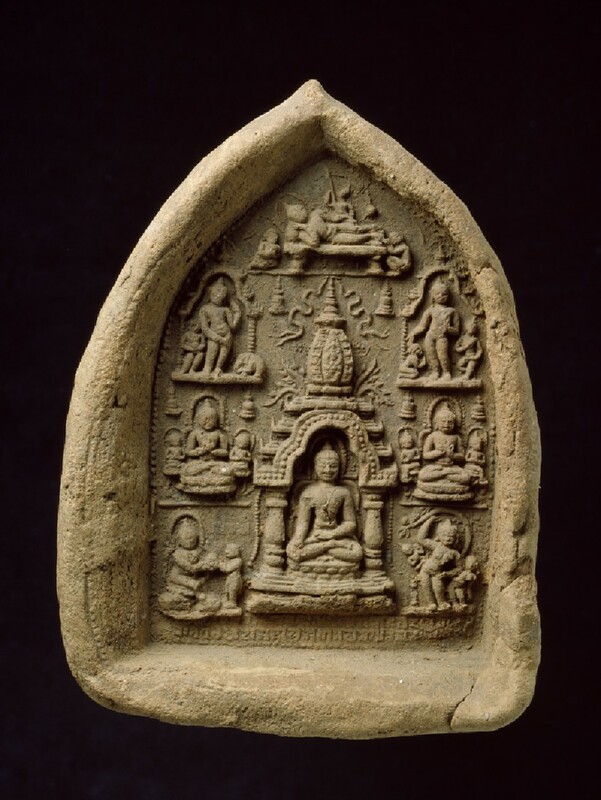 The Museum has a collection of over twenty votive plaques whose moulds can confidently be asserted to have been made in India, and usually at Bodhgaya, but the seal illustrated here, although showing strong Indian influence, is Burmese. The reason for this choice is primarily the unsurpassed crispness of the detail and the beauty and the interest of the little scenes depicted around the Buddha. Also, although the inscription illegible, it can be assumed that it ended quite exceptionally, after the Buddhist creed, with the name of the person whose pious gift it was, in this case a man named Mahāsālini. Ordinarily the donor is not named; on Burmese, dedicatory inscriptions, where they occur, are generally on the reverse, in one of the local languages. Around the enshrined central figure of the Buddha achieving enlightenment are depicted (clockwise), though not in the order of their occurrence, the other seven great events of the Buddha’s life: the monkey’s offering of a bowl of honey, the first sermon, the taming of the mad elephant, the Parinirvāṇa, the descent from heaven of the thirty-three gods, the miracle of Śrāvasti and the birth. The little upturned eaves of the Buddha’s towered shrine are unmistakably Burmese.